Just get a customer to buy from you two times, and he or she will be nine times more likely to become long-term repeat customers for your company. There are several ways you can encourage repeat purchases, but email remains the favorite among all the different marketing channels. Here’s why: If done right, email brings 4400% ROI and $44 for every $1 spent. Isn’t that incredible? Let’s understand how you can use email marketing to encourage repeat purchases. Once a subscriber has made a purchase from your store, send out personalized product recommendations based on the previous products purchased. You can employ artificial intelligence and send out more relevant emails that would drive better conversions. 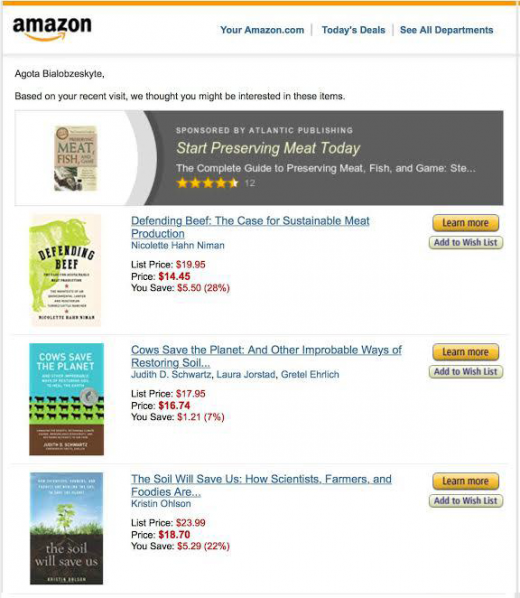 Take a look at this example by Amazon. 86% of shoppers wouldn’t mind paying more for a product if they get a better customer experience. Automate your email campaigns to trigger behavioral emails based on the subscriber’s action. This will mitigate your effort and you will be able to enhance the subscriber experience too. 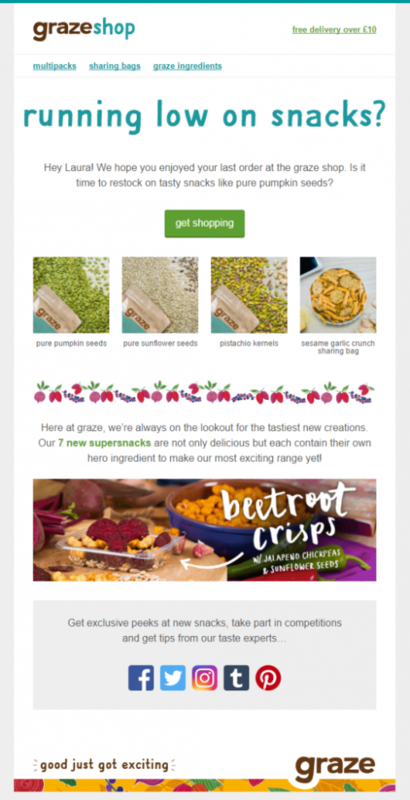 Graze sends an apt replenishment email without sounding too pushy. After the customers have made the purchase, send a feedback email about how they liked the product or service. Doing so will make them feel that their validation is important even after they have already purchased from you. In case they are not happy, you have the chance to resolve the issue and build a credible brand reputation. 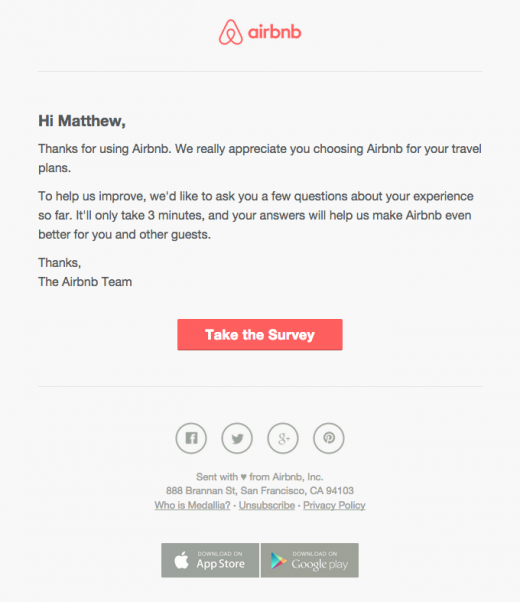 Airbnb sets a good example of feedback email as they also mention the time that it would take to complete the survey. Cart abandonment is the worst nightmare for any marketer as it leads to huge loss of revenue. Therefore, it is incumbent upon the marketer to have an effective cart recovery program. Whenever a subscriber leaves the product unattended in the cart, you should send out a cart abandonment email to remind them of the product and compel them to complete the purchase. We recommend you send a series of cart abandonment emails to enhance the effectiveness of your campaigns. 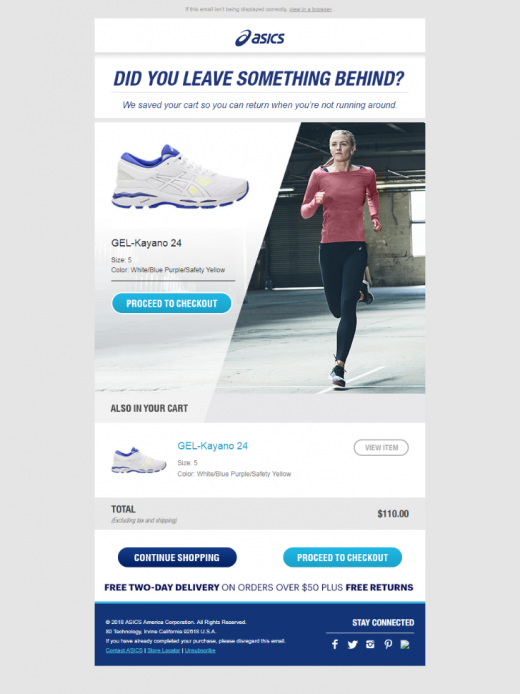 ASICS presents a great example of sending two emails in their cart abandonment series. You can also include a discount offer or free shipping in your cart abandonment email to propel the purchase decision. Just make sure that your subscribers do not gamify the strategy and you do not attract discount shoppers. Your transactional emails can work wonders to prompt repeat purchases. They can be a great opportunity to upsell or cross-sell your products. Include “Products you may like” section in the order confirmation emails to showcase related products based on the items purchased. Here’s an example by Kickstarter to help you understand better. See how they have included related projects in the order confirmation email. The subscriber should think of your brand as soon as they receive the email. Therefore, you should design consistent emails that build brand recall. Use the same brand logo, type of font and colors to connect with the subscriber. 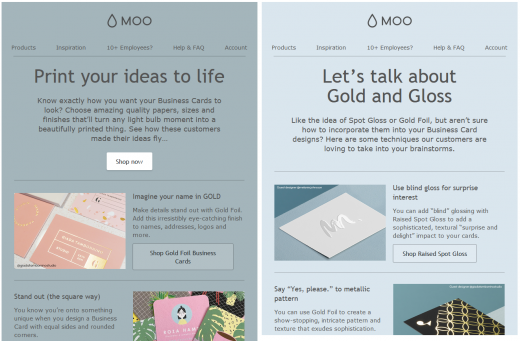 Take some inspiration from the online print and design company Moo. They build a nice brand personality through all the emails. Special occasions like birthdays and anniversaries, and days like Mother’s Day, Valentine’s Day, Father’s Day, and Holiday Season are the best windows of opportunity to generate repeat customers. Leverage occasion-based email marketing by promoting limited-time offers and create a sense of urgency. This will help you drive instant purchases by tapping on the “Fear of Missing Out” (FOMO) instinct. 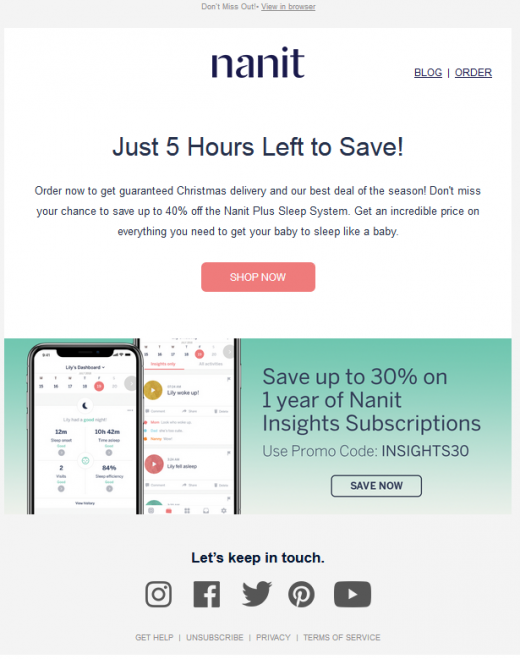 Check out the email by Nanit where they have promoted the last 5 hours of their sale. As there are numerous marketing channels sprouting up in the digital world, it is of utmost importance to create an omnichannel experience. 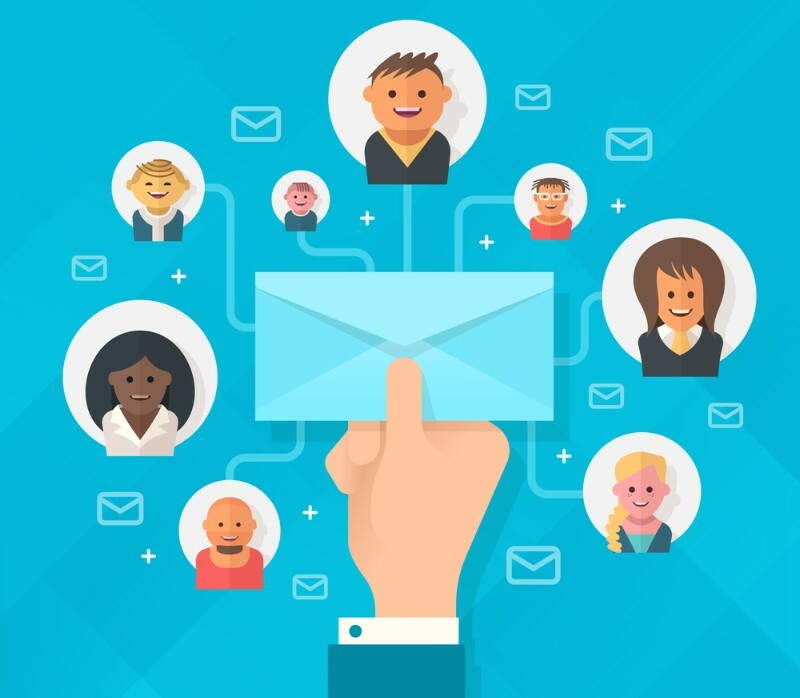 Integrate social media marketing in your email marketing strategy to encourage your customers to interact with you on platforms other than email. An active social media presence builds credibility and drives more conversions, thereby increasing the likelihood of repeat purchases. Your calls-to-action determine the conversion rate of your email campaigns. Place the CTA in such a way that it is clearly visible. Use contrasting colors to grab the subscriber’s attention and instantly convert them. Check out the striking CTAs in the email by Carnival Cruise Line. Try using first-person narrative like “Download my free copy” as suggested by a report by Michael Aagard of Content Verve. Repeat customers are the most priceless asset for any business as they are easy to sell to and bring better ROI. These tips will surely help you get loyal customers and beget more evangelists for your brand.